It is amazing what a string of lustrous pearls can do for one’s self-esteem! Maharani’s from almost all India’s erstwhile princely states, could almost be recognised from the beautifully graded pearls that they wore round their necks—a style introduced by the stylish Maharani of Cooch Behar. Her daughter Gayatri Devi, the Maharani of Jaipur, went one step further and set a style of her own, by wearing French chiffon saris and her string of pearls, with elan. Needless to say, she set a style that is still in vogue! It is not known when humans discovered that foreign objects could be inserted into the shell of an oyster by design rather than accident, but is appears that the Chinese were adept at the art as far back as the 13th century. It was however left to Kichimatsu Mikimoto from Japan to perfect the commercial formula in 1916, for creating a pearl which looks remarkably like a real pearl. Since then the pearl industry has never looked back. Cultured pearls have all the characteristic shapes, lustre and colours of their natural cousins and only an expert could tell the difference. Before Mikimoto’s discovery, pearls of any size or quantity were only for the fabulously wealthy and were mainly collected by royal families around the world. Pearls have been popular in India for centuries and were particularly favoured during the reign of the Mughal emperors. Miniature paintings invariable depict royalty with long strings of pearls around their necks. Apparently, Emperor Shah Jehan was extremely fond of pearls and is said to have directed the architect who designed the Taj Mahal to create a ‘perfect pearl’ as a memorial for his beloved wife. The city of Hyderabad has had a long association with pearls and is known as the ‘city of pearls’. However, the irony is that Hyderabad is nearly 300 km away from the ocean! The pearls that give the city its name are mostly from China and have been coming from there for at least a hundred years. After being imported, they are drilled in different parts of the state. In Chandanpet located just outside Hyderabad, almost the entire population is engaged in the delicate art of pearl drilling. It is said that pearls were introduced into the region by Asif Jah, Aurangzeb’s viceroy, who became the first Nizam–ul-Mulk. Stories about the exquisite pearls possessed by them are legion and Osman Ali, said to be the richest Nizam of them all, is known to have had a hoard of pearls, hidden with rubies, emeralds and diamonds in bags in the palace basement. Azim Jah. One of the more recent Nizams is said to have presented a pearl in the size of a pigeon’s egg to his wife Dur-e–Shahwar (‘pearl of great price’), to match with her name. But it was not only the Nizams who owned fabulous pearls. The royal families of Jaipur, Gwalior and Baroda all had their share. The Gaekwad of Baroda had a seven-stranded Pearl Necklace, one of the most extravagant pearl necklaces ever created referred to as ‘The Baroda Pearls’. It was the most expensive piece of jewellery in the collection of jewellery that belonged to Maharaja Khande Rao Gaekwad of Baroda, who has gone down in history as the greatest collector of jewels and jewellery in the 19th century. Some of the extraordinary items in his collection include the famous seed pearl and jewel-encrusted carpet known as the ‘Pearl Carpet of Baroda’, a triple-tiered diamond necklace incorporating the 129-carat ‘Star of the South’ diamond and the 78.53 carat ‘English Dresden Diamond as its centrepiece., known as the “Baroda Diamond Necklace’ and the seven-stranded diamond and emerald necklace known as the ‘Hindu Necklace’. 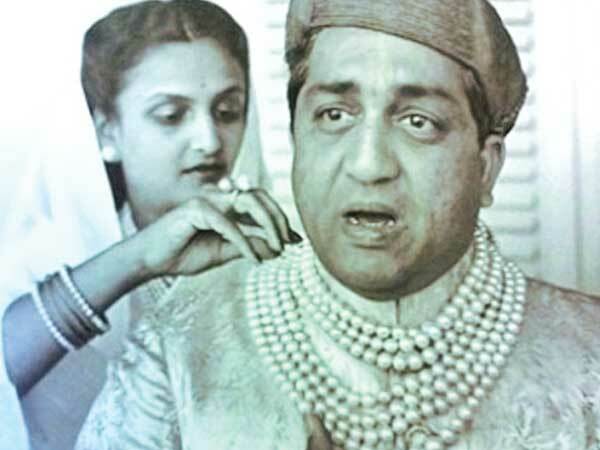 A seven-stranded pearl necklace said to have been created during Mughal rule and referred to as the ‘Baroda Pearls’ became internationally famous when a photograph of the 12th Gaekwad Maharajah Sayaji Rao III (the most enlightened monarch among the Gaekwards) was featured wearing the necklace in a book—Book of the Pearl, published in 1908 by George Fredrick Kunz. In 1943, the 13th Maharaja Pratapsingh Rao Gaekwad (the last Gaekwad Maharajah who ruled between 1939 and 1951) made headlines by marrying the beautiful Sita Devi, his second wife. Sita Devi, who chose to live in Monaco, became one of the most famously flamboyant maharanis of all time. After the marriage, Maharaja Pratapsingh, indulged her passion for fine Indian jewellery and the Baroda Pearls, the Pearl Carpet and other precious items from the collection, were gifted to the Maharani. Western media took to referring to her as the India equivalent of Wallis Simpson. The Baroda Pearls once again gained international attention at the time India became an Indian republic. Maharaja Pratapsingh Rao Gaekwad once again wore the famous necklace and was photographed by the famous photographer, Henri Cartier Bresson. While many of Sita Devi’s jewels were sold in Monaco in later years, the seven-strand pearl necklace remained a part of the Baroda royal treasury. But alas, it had to be sold and was made into a 2-strand ‘Natural Pearl’ necklace of 68 graduated pearls measuring about 9.47–16.04 mm with a diamond clasp made by Cartier. The remaining 4th, 5th, 6th and 7th strands of the Baroda Pearl necklace, and a brooch and a ring en suite, are known to have set a world auction record in New York of $7,096,000, in April 2007. Pearls are no longer restricted to those with a treasury to dip into. Though the high quality pearls are still for the seriously rich, cultured pearls no less than real ones, rely on the whims of nature. It is after all a natural process that has to be helped along by us. There is no guarantee that the bead inserted into the oyster when harvested be a pearl of quality or even a pearl at all!